OSCAR - The Water Rescue Training Dummy is the training dummy that truly replicates a 180 pound rescue victim; and, is used by the US Coast Guard, Municipalities, and Rescue Training Organizations, and companies committed to proper safety training of water rescue procedures. Practice Man-Overboard / In-Water training sessions with a dummy that replicates a 180 pound rescue victim. OSCAR is durable yet affordable. Storage weight dry is 35 pounds. Fill OSCAR with water, and OSCAR replicates an adult Man-Overboard with head and arms floating above water. OSCAR will give your water rescue training team a realistic victim to work with, so in the event of an emergency, your crew will be prepared for the rescue. It's the simplicity of OSCAR's construction that makes this your best value for a training dummy to own for your Man-Overboard, Swift Water, and other rescue training procedures. 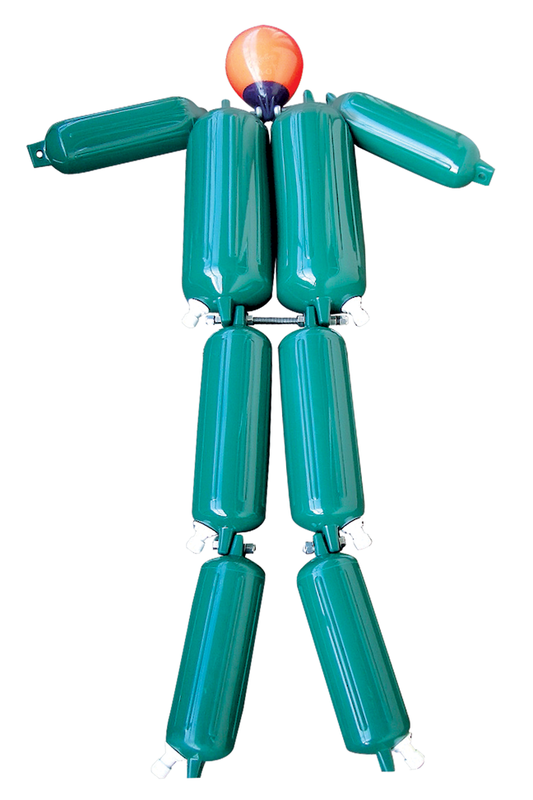 Using a training dummy that weighs and floats like an adult will make sure your rescue team is ready for the realities of a rescue operation. Don't settle for sub-par training victims to teach your personnel water rescue operations. OSCAR - Water Rescue Training Dummy replicates a 180 pound victim, yet storage weight of OSCAR is only 35 pounds, so you can easily transport it to point of training operations. Its solid construction will last for years. Oscar is 6 feet tall and comprised of extremely tough vinyl impact bladders and stainless steel joints. A galvanized shackle allows lifting from the shoulder. Oscar can be easily assembled and disassembled using standard 15/16 inch open, box, or socket wrenches. The dry storage weight is approximately 35 pounds. Before use, the bladders are filled with fresh or salt water from a deck hose. When properly filled, Oscar will weigh approximately 180 pounds. His arms and head will float but the remaining body will be immersed into the water, replicating a water rescue victim. Because there are no protruding or rough edges, you can outfit OSCAR with a personal flotation device, dry-suit, or leave as is. After training use, the bladders can be drained for transport and stowage. Because his weight must represent an adult victim, it's important to fill the vinyl impact bladders near the testing area. Oscar floats at chest level like a human, and at 180 pounds it provides a very realistic human size and weight for the recovery of a victim out of the water into a rescue craft. Oscar can withstand repetitive drops overboard from any realistic height. Weight: 35 pounds dry / 180 pounds filled with fresh or salt water. Materials: Heavy duty vinyl body parts, PVC fill/drain fittings, Stainless steel joints, galvanized lifting shackles. Oscar is manufactured from high-quality components in the United States. OSCAR comes with a 1-year parts and labor warranty. OSCAR is now available in Orange. 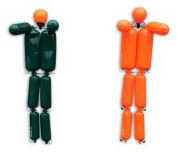 Click the button below to add the OSCAR - The Water Rescue Training Dummy - Forest Green to your wish list.